Auro 524 Plantodecor is a natural and non toxic washable emulsion paint for walls and ceilings with great covering power. Ideal for high traffic areas, kitchens and bathrooms, and commercial projects. The Auro 524 is their most recent washable white emulsion recipe and replaces the Auro 324. The 524 is a superior product; it dries quicker, is more durable and covers better. It has a brand new natural plant based binder - Replebin® - holding pigment and paint together better than ever. This Auro Plantodecor natural washable emulsion paint is a premium product and a big step up from the older standard eco emulsion Auro 321. Auro 524 has an Abrasion class of 1 while Auro 321 has an Abrasion class of 3 (the lower the number the more "scrubbable" the cured paint is). Auro 524 is a vegan paint that is natural and completely cruelty free. It contains extra natural oils, making this paint resistant to wet washing and scrubbing. 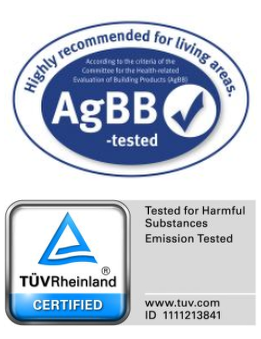 Thanks to Auro's ecological choice of raw materials and compliance with the strict AgBB criteria on emissions (a German evaluation scheme for VOC emission from construction products), this product is a special recommendation for use in living areas. This Professional Emulsion gives the highest white opacity in the Auro range, you will not be disappointed with the finish. This paint is for interior use only and should be applied using a roller or a brush. The Auro Washable Emulsion paint is the best white washable wall paint available, it is also natural, breathable and provides excellent coverage. Auro 524 is suited for all indoor surfaces, it adheres to old and new plaster including lime plaster, dry lining boards, previously painted surfaces even on latex (vinyl) paints and other "difficult" substrates. Auro washable wall paint has excellent coverage and hiding power. It is really easy to use as it has a very low tendancy to drip or spatter. If you need a washable emulsion in colours, go to Auro 555 Washable Emulsion (colours are no longer available in Auro 524). * Replebin is an innovative, biogenic binder. It has been developed by Auro throughout a long term and complex research process. Replebin consists of plant alcohol esters with organic acides. This modern binder is legally protected and only available at Auro. Natural products are neither odourless nor emission-free. The use of natural and plant based ingredients means that allergy and asthma sufferers and people who are chemically sensitive are much more able to tolerate Auro products, however they may cause allergic reactions in some. If you wish to know about what raw ingredients Auro use in their products please visit our Auro Raw Materials Guide. For more detailed information download the 524 Technical Datasheet and 524 Safety Datasheet. Click the button below to add the Auro 524 White Premium Washable Emulsion to your wish list.